We’re huge Hanabi fans, so when we heard that Beyond Baker Street played similarly, we were pretty excited to give it a try. Is BBS a Hanabi replacement? Is is worth it to own both? Well, let’s just get to the Beyond Baker Street board game review! What is Beyond Baker Street? Beyond Baker Street is a cooperative deduction game in which you and your fellow detectives will be racing Sherlock Holmes to try to solve a case. Your job is to prove who the criminal is, their motive, and what opportunity they had to commit the crime. You will have all of the clues at your disposal, but you will need to help each other to figure out which ones to use to solve the crime. 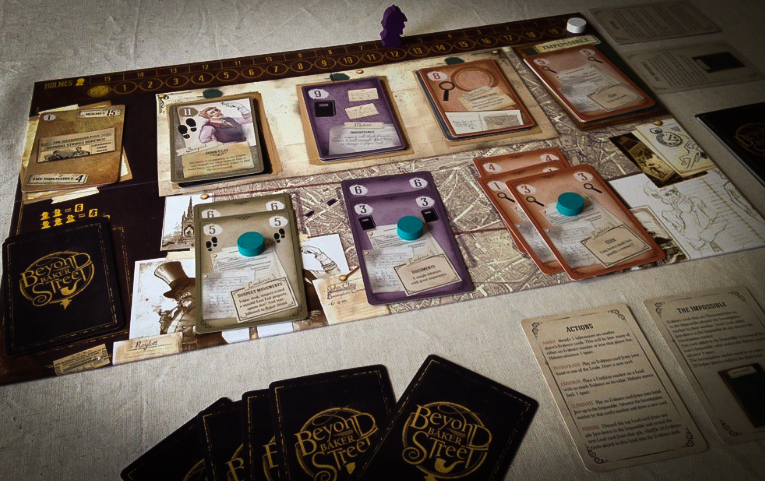 Beyond Baker Street was designed by Robin Lees and Steve Mackenzie and published by Z-Man Games. Throughout the game, no one will be able to see their own evidence cards. However, you can give tips to and receive tips from your teammates. Each card is going to have a number and an evidence icon on it. When giving tips, you can tell a fellow investigator how many of one number they have or how many of a specific evidence type they have. The trick to getting good at the game is putting your cards in an order that you can remember so you know exactly what to play when the team needs your help. Every time a clue is given, Sherlock Holmes moves closer to solving the case. You really can’t just keep giving clues since that speeds up the Holmes timer and gets you closer to a loss. Each game is going to have a suspect, a motive, and an opportunity card showing and three more face-down cards in each pile. These cards have numbers on them that you will need to match by throwing down a combination of evidence cards from your hands. When you match the number, you can use an action to confirm the lead and move Sherlock Holmes back one spot on his track. If you ever exceed that number, though, you will have to replace the card, usually making the game tougher to beat. If you ever know that you don’t have the cards to match a lead’s number, then you can use an action to replace it with one of the face-down cards underneath it. However, if any of the three piles ever runs out, everyone loses. Another important part of the game is moving cards to “The Impossible.” You do this by discarding a card from your hand, which moves the marker up on the Investigation track. This track is another key part of winning the game since you need to hit exactly 20 to solve the case. After you’ve played a few games, you can add in character cards to give each player unique skills or hindrances. For example, when Inspector Barnes confirms a lead, he moves Sherlock Holmes two spaces back on his track instead of one. You will lose the game if Sherlock Holmes solves the case first, if you move the Investigation track past 20, if you confirm all three leads before you’ve reached 20 on the Investigation track, or if you run out of leads. You’ll win if you get the Investigation track to exactly 20 and confirm all three leads. Like in Hanabi, Beyond Baker Street requires a lot of teamwork. Everyone has a chance to take part and help the team out by giving clues and trying to solve the puzzle. This isn’t the type of co-op game where there can be an MVP since players are working together during every turn. The artwork on the board and cards looks great. The primary mechanism might not bring the theme to life (see below), but you definitely feel closer to Sherlock’s world once you see everything laid out on the table. Even though there aren’t too many rules that you need to remember in this game, we always appreciate when reference cards are included. They make teaching the game a lot easier and everyone can quickly glance at them to remember the actions that they can take. Going by the standard rules, I really don’t find Beyond Baker Street to be a very tough game. Well, it’s not as challenging as Hanabi, at least. My group has actually won about half of our games using all of the case files and different combinations of investigators. While the variable setup gives the game plenty of replay value, it might not provide enough of a challenge for people who are used to these types of games. As I mentioned above, the theme is definitely there, but it’s not as strong as I had hoped. Pointing at numbers and symbols doesn’t do much for the game thematically, at least for us it doesn’t. Maybe this system just works better in an abstract game. It’s easy to see why many people call Beyond Baker Street the “Hanabi Killer,” but that’s just not the case for my group. While BBS is a good game, most of us still prefer the more portable, accessible, and challenging Hanabi, which is one of our top family games. No one in our group dislikes BBS, though. I should also point out that we usually don’t keep multiple games that share a theme (unless they’re all AMAZING), and no Sherlock Holmes board game is going to be replacing Consulting Detective anytime soon. And while Hanabi’s fireworks theme is quite light, it’s at least original. That being said, if you absolutely love all things Sherlock Holmes, then you’ll probably be very satisfied with Beyond Baker Street. If you already own Hanabi and want more games like it, definitely get this one. Also, people who like the idea of Hanabi but need a bit more theme in their games might want to give this one a try. 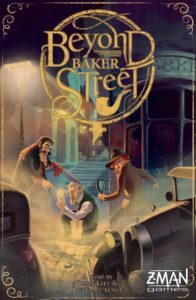 Thanks for taking the time to read our Beyond Baker Street board game review!